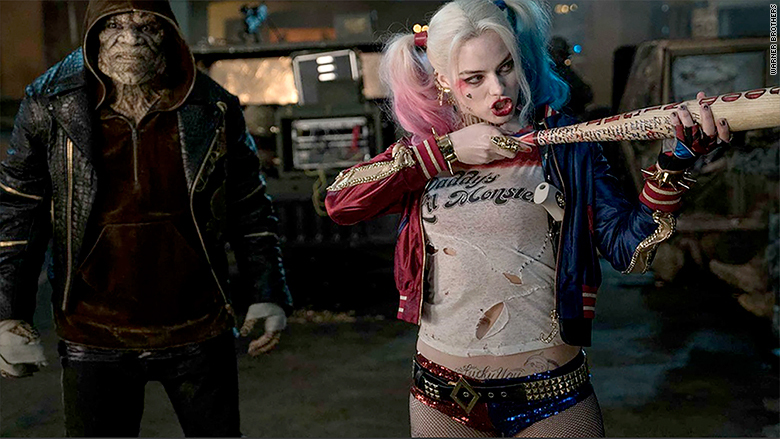 The "Suicide Squad" movie that premieres this weekend is loaded with some of DC Comics' best bad guys, but the character that steals the show (as well as a few valuables along the way) isn't a "guy" at all -- it's Margot Robbie's Harley Quinn. The movie is the big screen debut for Harley Quinn, the deranged henchwoman and on again, off again girlfriend of the Joker. But comic book readers will need no introduction to the psychotic, pigtailed character; she's a comic book icon, albeit an unlikely one. In just over 20 years, she's gone from a minor, one-off character in an animated series to having a rabid cult following. The role allowed Robbie to enjoy some freedom. "It was liberating to play her, to have no rules," Robbie told CNN at the film's New York's premiere Monday night. "In the position I'm in now where I have to be so careful with everything I do and say..."
"Being Harley," she said, smiling -- "She just doesn't give a s**t."
The character's origin story is as crazy as -- well, as she is. Quinn wasn't produced for a comic book. Instead, she debuted in the "Joker's Favor" episode of the children's television show "Batman: The Animated Series." "Harley Quinn came about as sort of a happy accident," Paul Dini, Quinn's creator, told CNN. "I needed to give the Joker a gang of henchpeople, so in addition to a couple of big tough guys I thought it would be fun to have a female character in there. I thought it would be fun to have a bubbly, blond, wise cracker character." He based the character on his friend, Arleen Sorkin, a former "Days of Our Lives" actress, who in one episode of that show was "running around in a jester costume in a sort of a fantasy sequence." Sorkin ended up voicing the character. She was originally meant to be in only one episode, but Quinn and her twisted relationship with the Joker, who she lovingly calls "puddin'," struck a chord with fans. "I patterned it after the way I've seen celebrity romances as interpreted through the gossip magazines," Dini said. "I thought if The Joker was going to have any sort of relationship with somebody, it has to be, one, with somebody who can keep up with him, and two, someone who's a bit of a kook themselves." 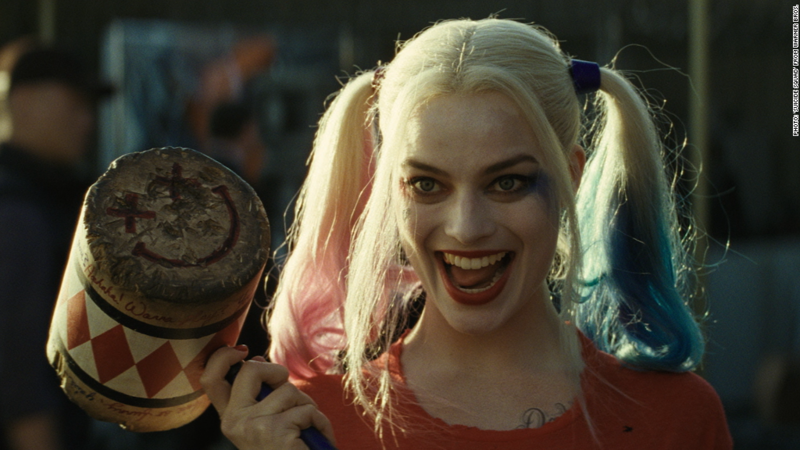 Margot Robbie looks to take some big swings as Harley Quinn in this weekend's "Suicide Squad." The character has now branched out to other TV shows, video games, her own comic book series and, of course, "Suicide Squad," one of the most buzzed about films of the summer. Since the film's first trailer, Robbie's portrayal has stood out as an interesting female force in a film world of supermen. In a genre in which portrayals of women can be one-dimensional or overly sexualized, Quinn is drawn in more complex terms. Once the Joker's psychiatrist, she ditches her doctor's coat when she falls in love with her patient. Despite the extreme ups and downs in their relationship -- the Joker both emotionally and physically abuses her -- many fans see Harley Quinn as a feminist force. On the surface, she seems like the worst type of stereotypical female comic book character: she's a foil for a man, her hair is in pigtails, and she wears hot pants. The critics who feel that way about Quinn do have a legitimate argument, but she's grown beyond the most superficial aspects of her persona, and is often written as an explicitly feminist character. Dini agrees with a feminist reading of Harley. For him, it comes down to one word: choice. "I think Harley's entire character is based on the concept of choice," he said. "As long as she has that element of choice to either be like the Joker or to get away from him, that defines her life. She's not a victim who just goes where she's told to." Dini added that in the same way Batman represents our dreams of doling out justice, Quinn speaks to everyone because she acts out our desires to do what we want when we want to do it. "I think Harley is the Id in a lot of ways," he said. "She's freedom, she's fun, she's just the spirit of manic semi-heroism. I think that we'd all like to be that at some point. Maybe we can't be as dark and as grim as Batman, but I think just about anybody can pick up a baseball bat and make a joke." Or, as Robbie put it, fans love Harley because she just doesn't give a s**t.